What to test? 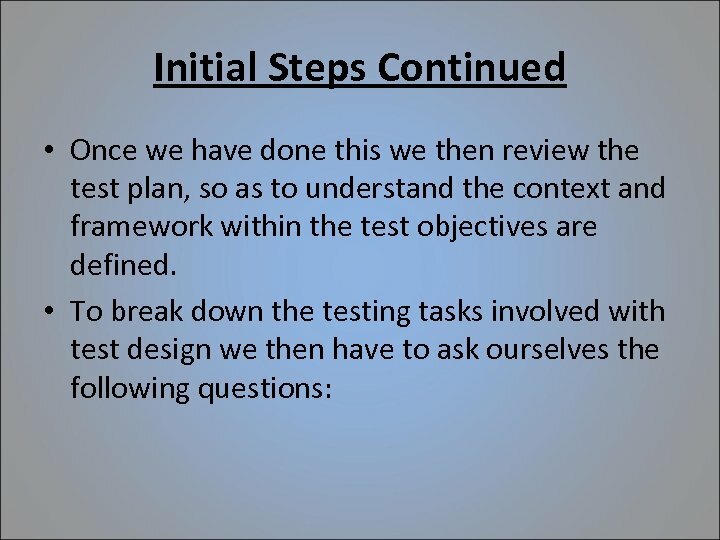 • This should have been documented during the test planning phase so all we have to do is to review our test plan. 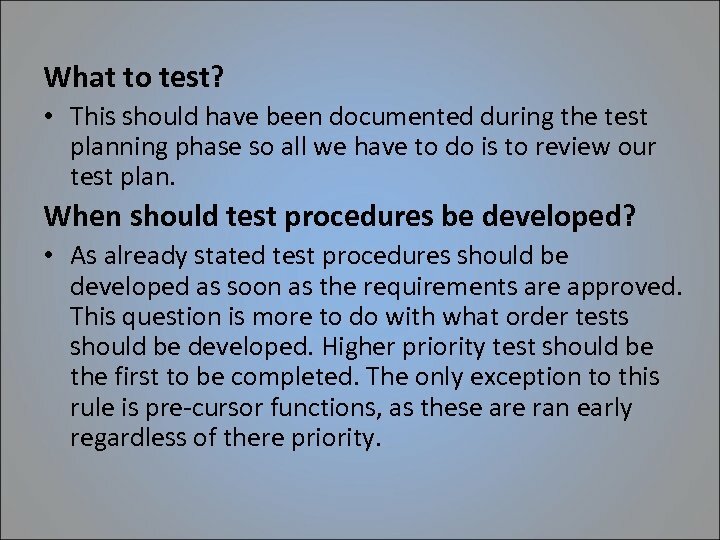 When should test procedures be developed? 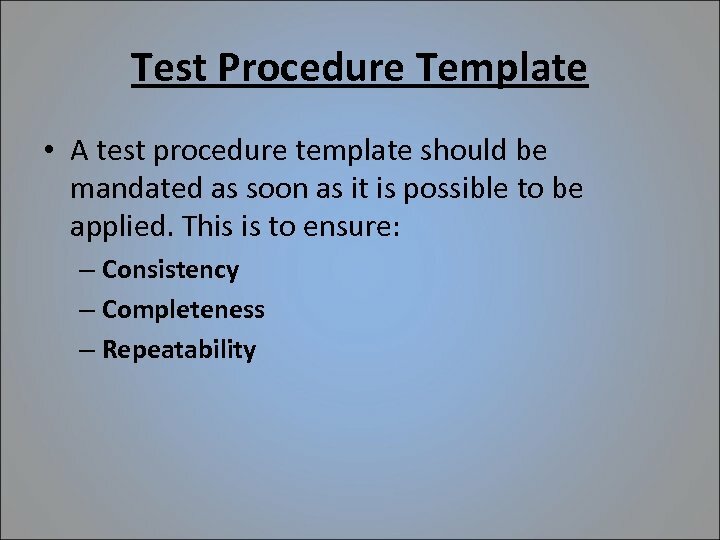 • As already stated test procedures should be developed as soon as the requirements are approved. 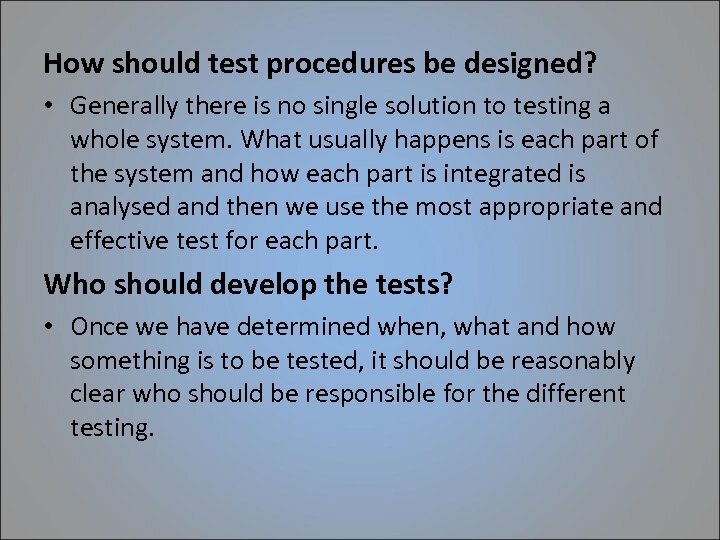 This question is more to do with what order tests should be developed. Higher priority test should be the first to be completed. The only exception to this rule is pre-cursor functions, as these are ran early regardless of there priority. 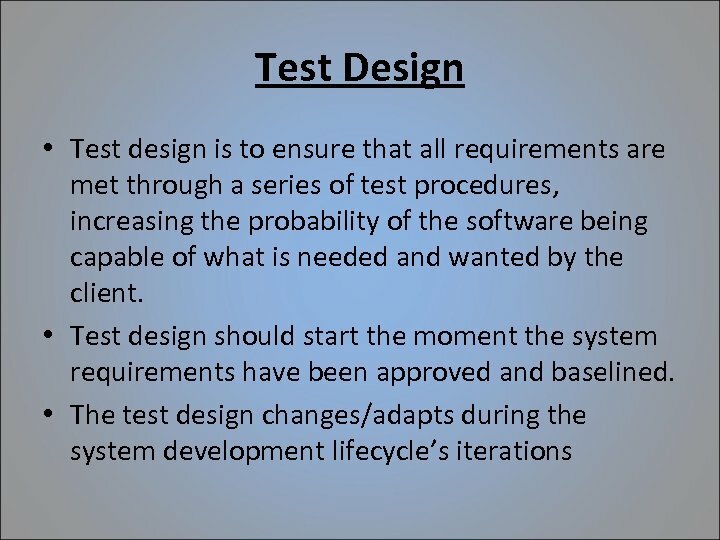 How should test procedures be designed? • Generally there is no single solution to testing a whole system. What usually happens is each part of the system and how each part is integrated is analysed and then we use the most appropriate and effective test for each part. Who should develop the tests? 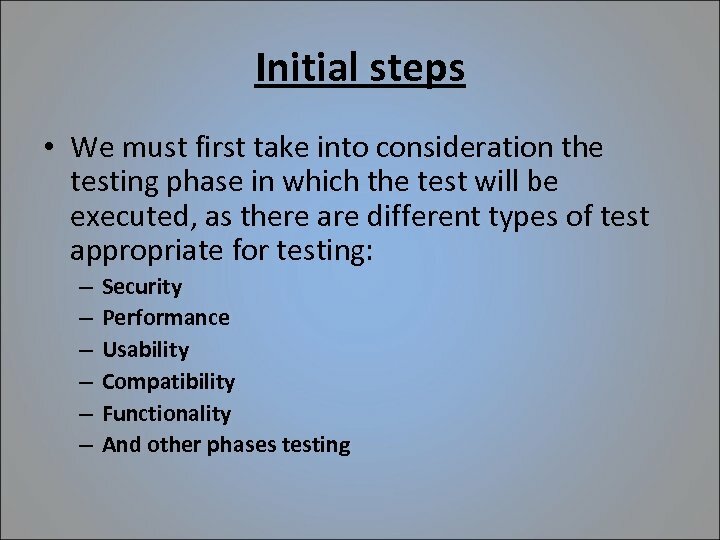 • Once we have determined when, what and how something is to be tested, it should be reasonably clear who should be responsible for the different testing. 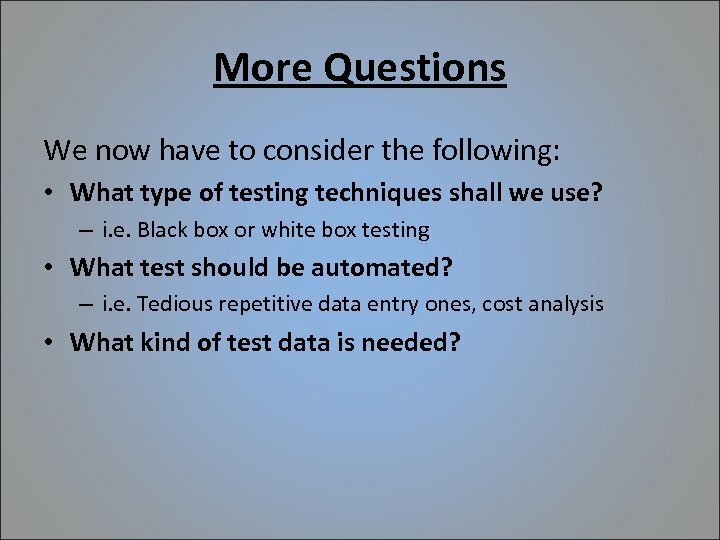 More Questions We now have to consider the following: • What type of testing techniques shall we use? – i. e. Black box or white box testing • What test should be automated? 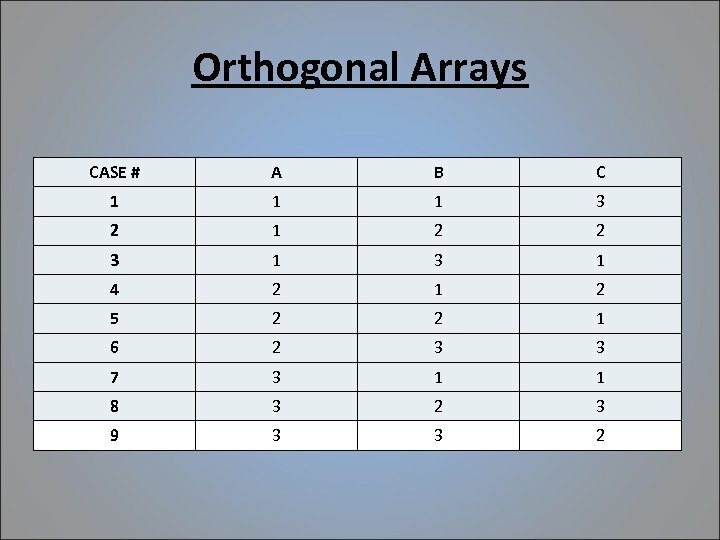 – i. e. Tedious repetitive data entry ones, cost analysis • What kind of test data is needed? 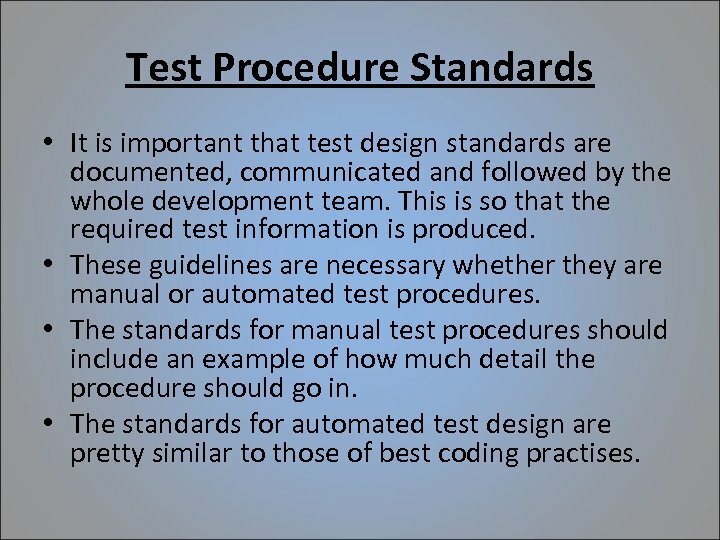 Test Procedure Standards • It is important that test design standards are documented, communicated and followed by the whole development team. 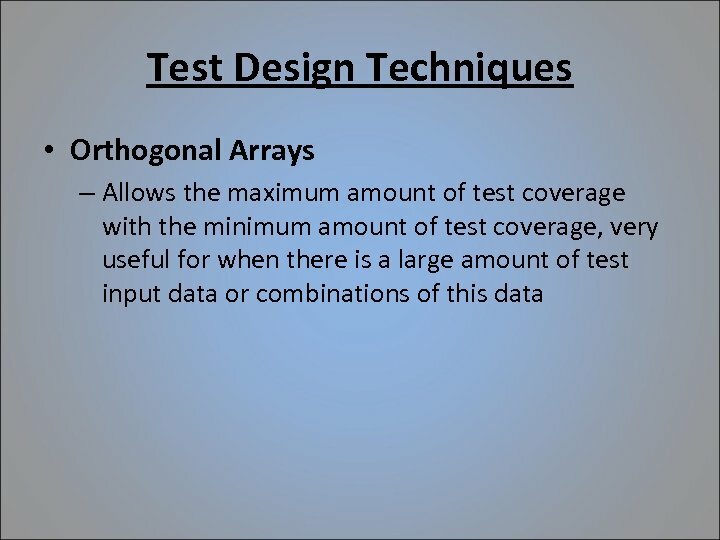 This is so that the required test information is produced. 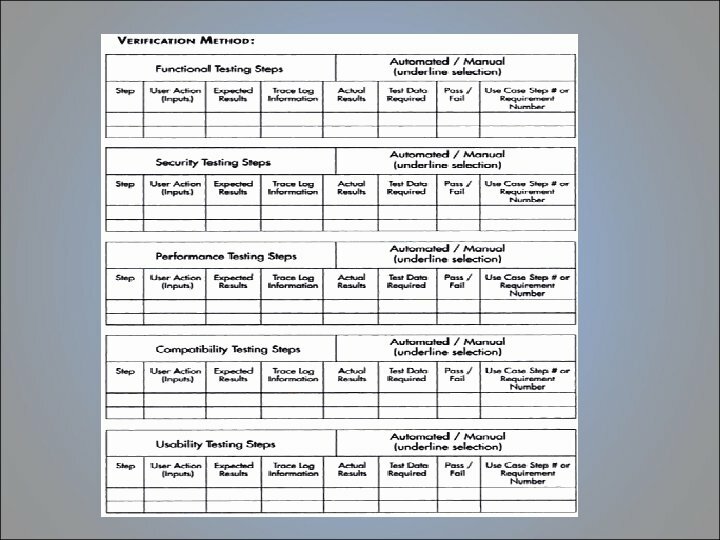 • These guidelines are necessary whether they are manual or automated test procedures. 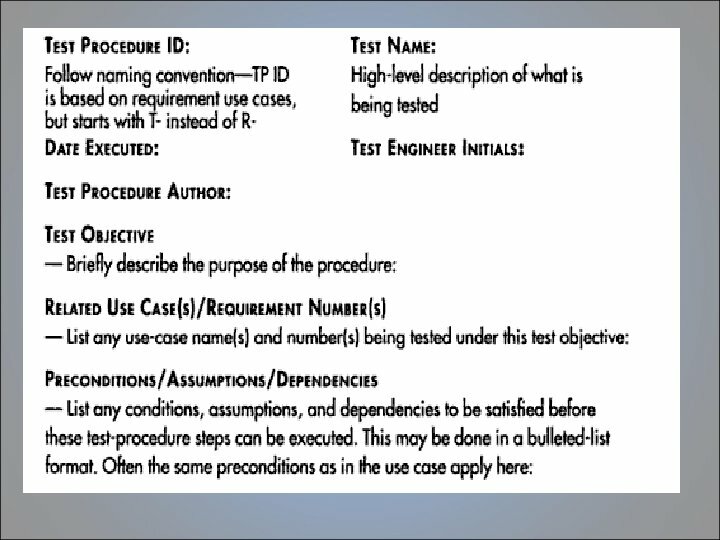 • The standards for manual test procedures should include an example of how much detail the procedure should go in. 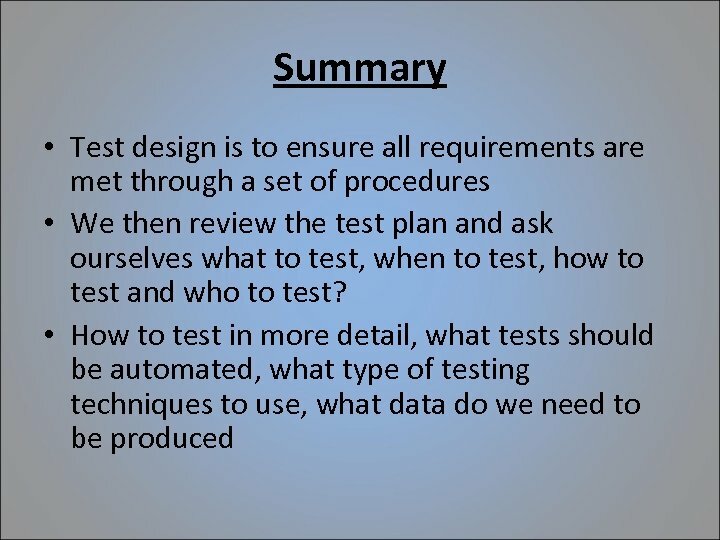 • The standards for automated test design are pretty similar to those of best coding practises. 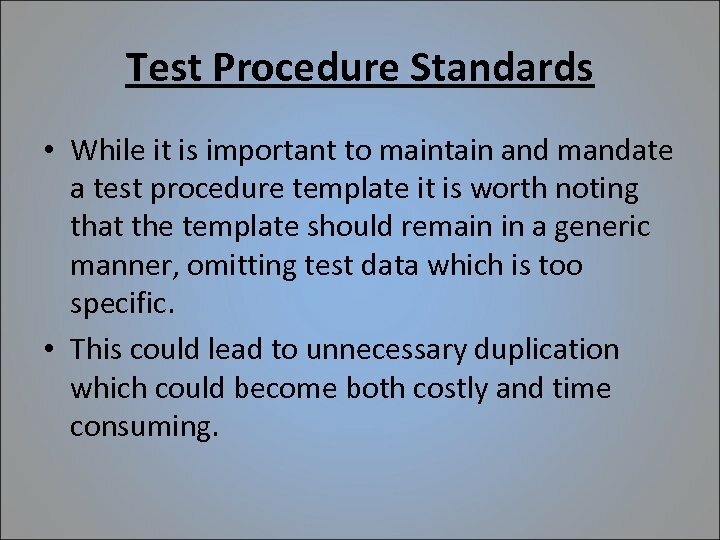 Test Procedure Standards • While it is important to maintain and mandate a test procedure template it is worth noting that the template should remain in a generic manner, omitting test data which is too specific. • This could lead to unnecessary duplication which could become both costly and time consuming. Test-Design Techniques • The amount of test variations is endless, to narrow down the amount of necessary test procedures we use certain test-design techniques: • Functional Analysis – Involves analysing expected behaviour against functional specifications, then generating one or more test procedure for each function • Equivalence Partitioning – Identifies ranges of inputs and initial conditions that produce expected similar results. It eliminates tests that are similar and hence narrows down the amount of tests to be concluded. 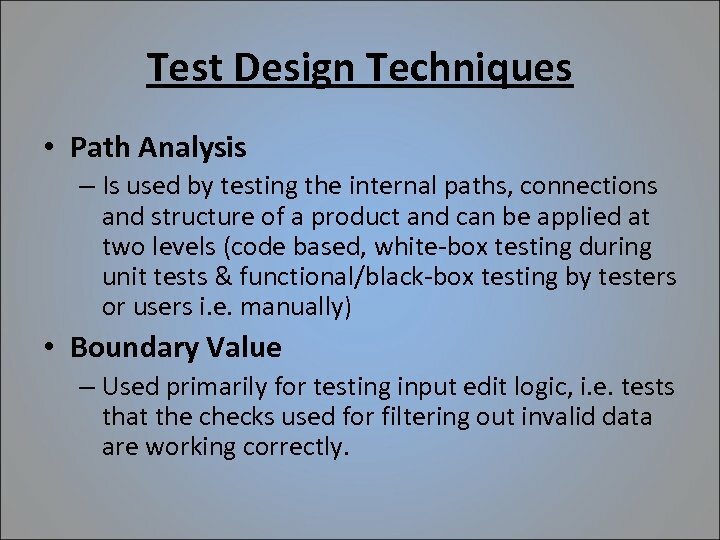 Test Design Techniques • Path Analysis – Is used by testing the internal paths, connections and structure of a product and can be applied at two levels (code based, white-box testing during unit tests & functional/black-box testing by testers or users i. e. manually) • Boundary Value – Used primarily for testing input edit logic, i. e. tests that the checks used for filtering out invalid data are working correctly. 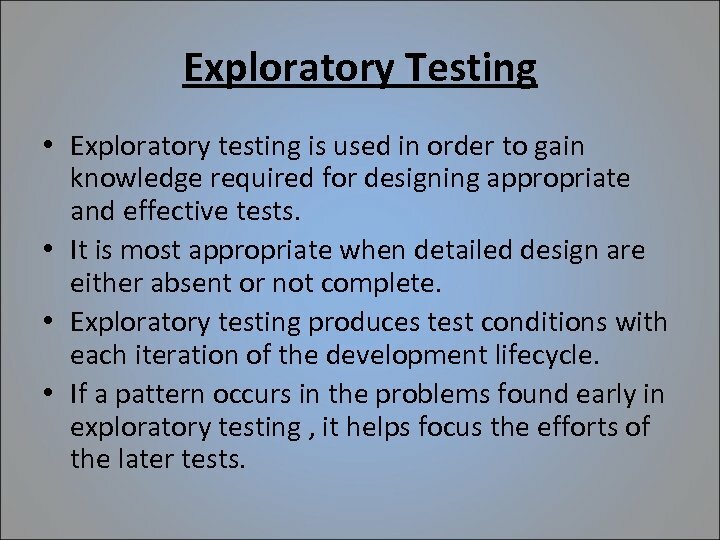 Exploratory Testing • Exploratory testing is used in order to gain knowledge required for designing appropriate and effective tests. 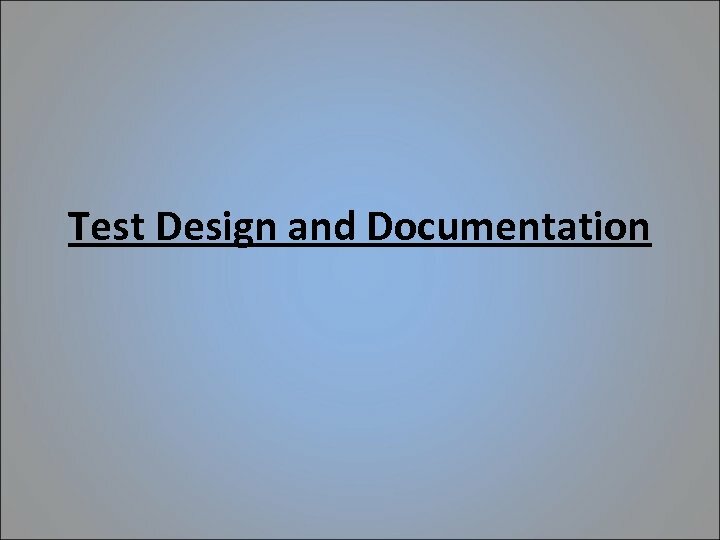 • It is most appropriate when detailed design are either absent or not complete. 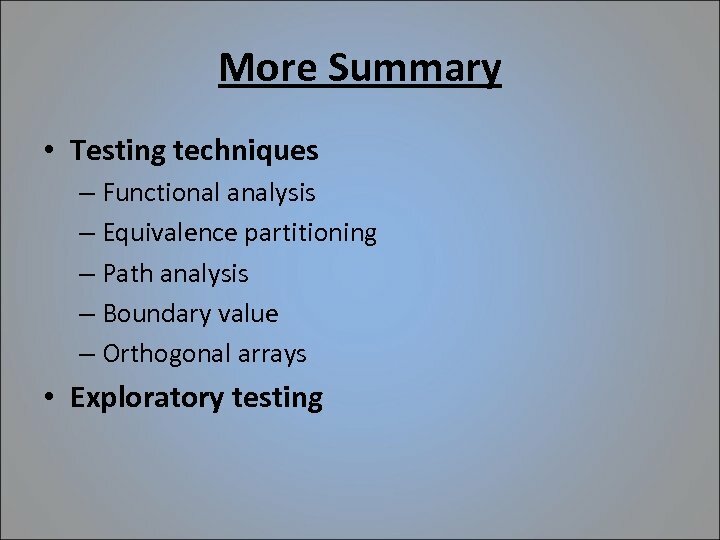 • Exploratory testing produces test conditions with each iteration of the development lifecycle. 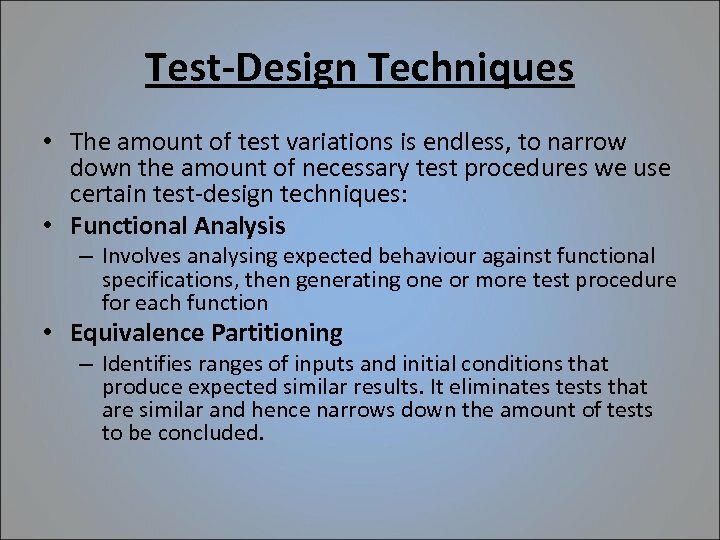 • If a pattern occurs in the problems found early in exploratory testing , it helps focus the efforts of the later tests.